Skinny pants and I have a love/hate relationship- very rarely can I find a pair of skinny cut jeans or pants that fit me properly. Usually, they’re way too tight in the leg and saggy on top when you wear them out for a few hours, they stretch in all the worst spots! I finally found a pair of black twill pants that fit my figure and don’t cling/sag in the wrong spots so they’ve been a staple in my wardrobe- totally an investment piece! Now… to invest in some new colors! Have you noticed the popularity of the cutout sleeve lately? (Like this one or this red top I adore!) I’ve seen them everywhere and I love them, they’re kinda fun ya? 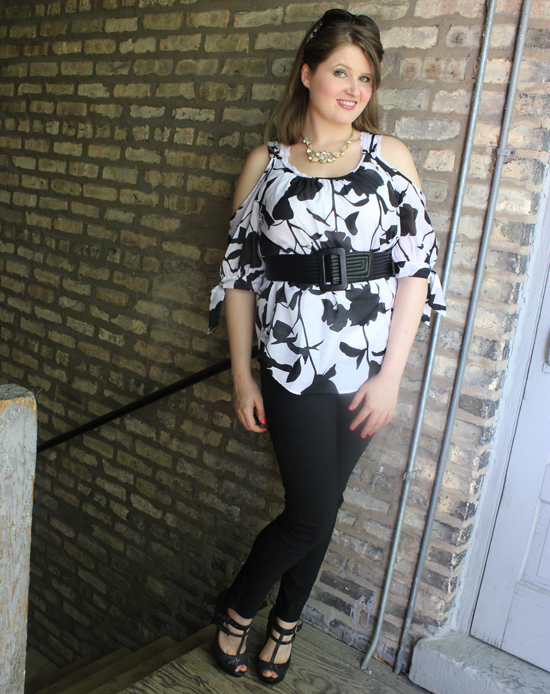 My frugal tip for this look is to invest in a few key pieces that fit right & work with anything- like a pair of skinny jeans that flatter and a pair of black pumps that always work…then mix it up with a statement piece of jewelry you snag on sale. Statement jewelry isn’t always appropriate- but if you get it on sale your dollar goes a bit further for the complete looks you can use it with! 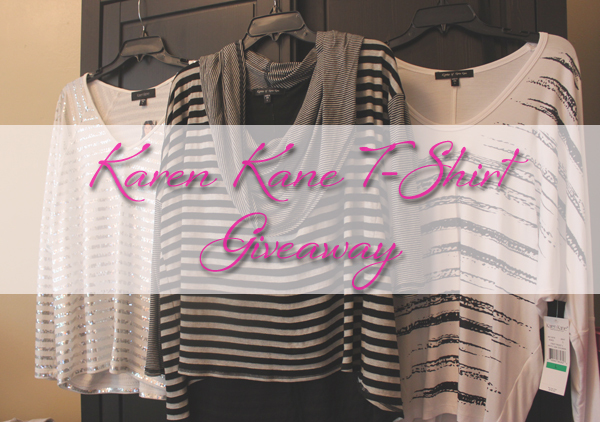 Check out BeautifulGiveaways.com to enter to win 3 shirts from Karen Kane! 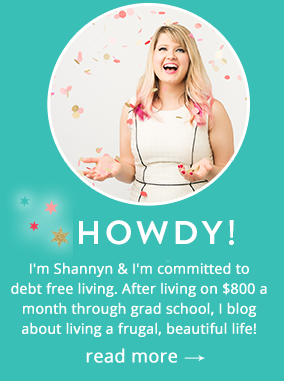 Is Beauty & Fashion Blogging Just An Excuse For Excess? Love the shoes. When I shop, I’m so picky about what I buy because I like to be able to mix and match my clothes. This give away is amazing!! I hope I win!! I love Karen Kane! Their pants are super comfy…it’s a bit pricier than I normally pay but they always have things on sale so it’s great to get stuff then! Those shoes are great. I’ve got a few pairs of shoes that have survived the test of time too. It’s funny – I’ll skip wearing them for a season and then rediscover them the next year. I LOVE my black skinny jeans! I am a new fan of Karen Kane so thank you for this post & giveaway!!!! Cute outfit. The pants look great, and I like the belt with the top.